Ideal for archive box storage, a step beam frame is used to protect shelf inserts and offer a flush storage surface. 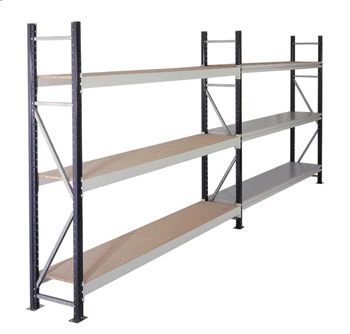 Shelves can store loads of up to 450kg uniformly distributed, and the shelf inserts are available in particle board, melamine, mesh decking and galvanised steel, all quality powdercoated finish in cyber grey. *Additional Sizes & Configurations Available. Just Ask!